Delaware resident Jennifer Butler poses inside Fresh Start Café & Bakery in downtown Delaware with her “Best Baker 2018” trophy and two first-place ribbons after winning the inaugural Fresh Start Baking Championship. 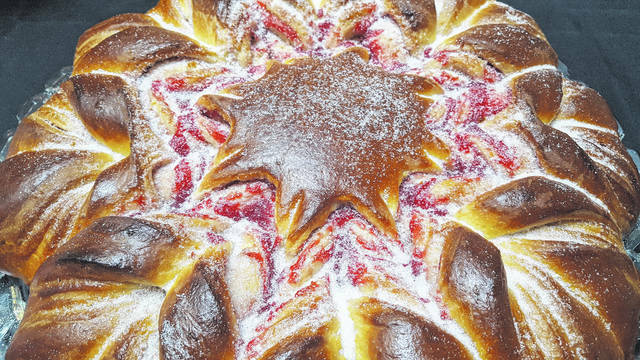 Pictured is the brioche star bread filled with homemade raspberry jam that Delaware resident Jennifer Butler entered as one of her three items in the inaugural Fresh Start Baking Championship. Family and friends of Delaware resident Jennifer Butler have known for quite some time that when it comes to baking, she can compete with the best of them. After deciding to step out of her comfort zone and put her baking skills to the test during the inaugural Fresh Start Baking Championship, Butler’s hidden talent is no longer a secret to the public after taking home the “Best Baker 2018” trophy. 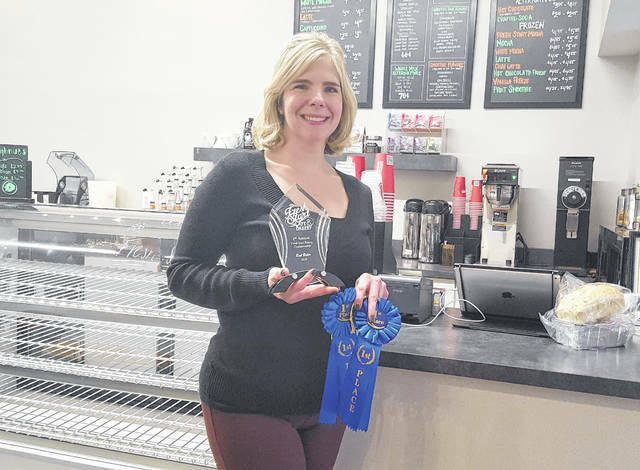 Butler nearly missed out on her crowning achievement as she almost talked herself out of competing in the contest, which was organized by Todd Daughenbaugh, owner of Fresh Start Café and Bakery at 24 N. Sandusky St. in downtown Delaware. Go for it she did. During the three-week competition, Butler said she spent over 20 hours in her kitchen preparing her entries as each contestant had to showcase their all-around baking skills by participating in weekly contests in the following categories: pastry and dessert; chocolate, candy, and confections; and breads and doughs. After receiving valuable feedback from various taste testers like her husband, Russell, and her two daughters, Butler entered the following three baked goods: an almond butter cake filled with homemade strawberry jam and topped with vanilla buttercream; a homemade caramel layered on homemade marshmallow and dipped in milk chocolate, and served in a sugar-sculpted bowl; and a brioche star bread flavored with orange zest and filled with homemade raspberry jam. After tasting 30 different baked goods from 10 different contestants over the three-week competition, the judges (Leigh Daughenbaugh, director of Fresh Start Café & Bakery; Brittany Hall, head baker at Fresh Start; Nathan Hall, executive chef at 1808 American Bistro; and Maria Saniel-Banrey, assistant baker & bread specialist at Fresh Start) agreed that overall, Butler’s three items, on average, were the best based on presentation, taste/flavor, originality/creativity and technique/complexity. While Butler surprised herself by stepping outside of her comfort level and competing in the contest, the fact she took home the title of “Best Baker 2018” didn’t happen by accident. Butler has been honing her baking skills since the age of 8, learning from her mother and grandmother. In addition to receiving the inaugural “Best Baker 2018” trophy, Butler’s prize pack also featured a KitchenAid mixer, a USA Pan bakeware set, a spot on the Fresh Start annual “Best Baker” photo wall, and free entrance into the 2019 contest to defend the crown. Daughenbaugh said he is already looking forward to hosting next year’s Fresh Start Baking Championship. Finishing second and third behind Butler in this year’s baking contest were Margaret Lux and Heather Nutter, respectively. Contact Joshua Keeran at 740-413-0904. Like The Delaware Gazette on Facebook.